and declared me Faasiq although you are the most faasiq"
"These books all Muslims look towards it with eyes of love and affection and benefit from its wisdom and everyone accepts me and attest to my prophethood/messiahship/mahdihood, except for the Zurriyatul Baghaaya (Children of prostitutes), whose hearts have been sealed by God, they don't accept." 8 So hearken not to those who deny (the Truth). 9 Their desire is that thou shouldst be pliant; so would thy be pliant. 10 Need not the type of despicable man ready with oaths. 11 A slanderer going about with calumnies. 12 (Habitually) hindering (all) good transgressing beyond bounds deep in sin. 14 Because he possesses wealth and (numerous) sons. 15 When to him are rehearsed Our Signs "Tales of the Ancients" he cries. 16 Soon shall We brand (the beast) on the snout! 9 Who would have had thee compromise, that they may compromise. 15 That, when Our revelations are recited unto him, he saith: Mere fables of the men of old. 16 We shall brand him on the nose. 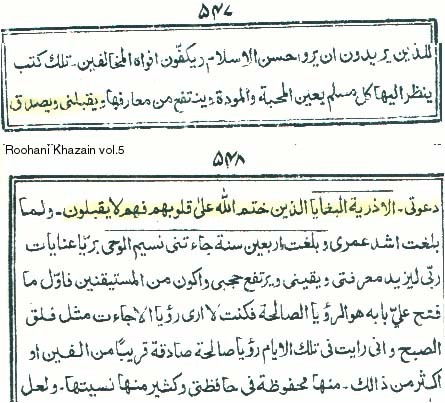 Thus, we once more know exactly what was meant by Mirza Ghulam's used of the word "baghaya". Yusuf Ali: "O sister of Aaron! Thy father was not a man of evil, nor thy mother a woman unchaste!" Pickthal: "O sister of Aaron! Thy father was not a wicked man nor was thy mother a harlot." Shakir: "O sister of Haroun! your father was not a bad man, nor, was your mother an unchaste woman." Malik Ghulam Faird, 1988, by Islam International Publ. "O sister of Aaron, thy father was not a wicked man nor was thy mother an unchaste woman!"